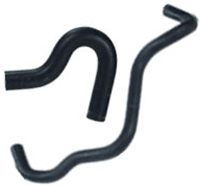 Goodyear's Molded Radiator Hose's are preshaped for specific applications and constructed to original equipment manufacturers' specifications. Molded to provide full flow through tight bends, ease of application, and to relieve stress on radiator connections. Made of Versigard rubber tube and cover to resist heat, ozone, and chemical coolants. Tylanar knit reinforcement provides burst limits exceeding SAE standards. Meets or exceeds SAE J20R4, D1 specifications. Goodyear's Molded By-pass and Heater Hose's are designed to transfer glycol-based coolants to and from the heater core, by-pass to the radiator, as well as through other components in the vehicle’s coolant system.